Submarines must surface to broadcast a message. The same is true for underwater drones. 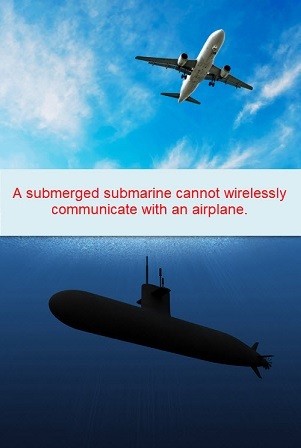 This is because submarines and drones utilize sonar, or sound waves, to communicate, while planes and aerial drones typically use radio signals (radar). Radar and sonar just don’t mix! Radar can travel for miles through the air, but the signal attenuates quickly in water. Sonar signals can’t break through the water-to-air surface. Historically, submarines attempt to stay underwater as much as possible to avoid detection, which leaves them unable to communicate to aircraft. Underwater exploration drones for offshore industry must interrupt their observations to transmit gathered data. Similarly, drones used for deep-sea exploration cannot send their data to scientists without either rendezvousing with above the surface vessels or buoys that act as intermediaries. 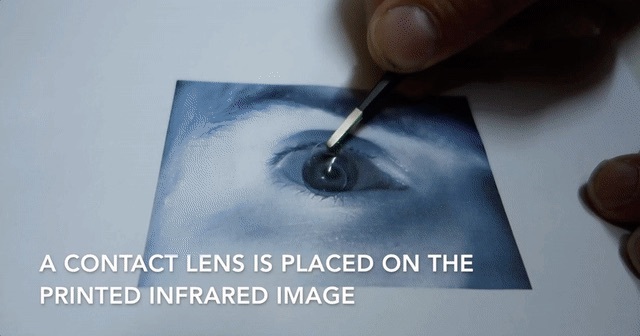 Now, this may all change thanks to new research from MIT. The system, developed by Fadel Adib, assistant professor in the MIT Media Lab, and his graduate student Francesco Tonolini, converts sonar directly to radar. It lets planes and drones monitor the water’s surface for incoming messages from subs and underwater drones. 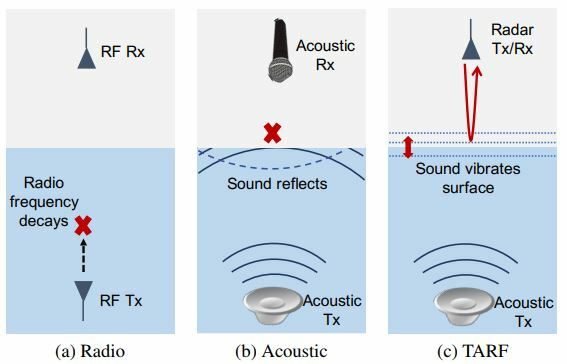 The system, translational acoustic-RF communication (TARF), transmits a sonar signal directly to the water’s surface. The signal causes small vibrations at the surface. A highly-sensitive millimeter wave receiver reads and decodes the tiny disturbances. The transmitter is a standard underwater speaker. 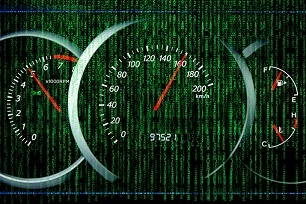 The signals use different frequencies to correspond to data bits. The transmitter uses signals in the 100-200 hertz frequency range, standard for underwater communications by submarines and AUVs due to low attenuation and long travel distances in water. A “0” is transmitted as a 100-hertz wave, and a “1” is transmitted as a 200-hertz wave. The TARF receiver is a millimeter wave sensor. It transmits a wideband signal and measures the reflections off the water’s surface. It analyzes the variations in the RF reflections and uses them to decode the bitstream sent by the transmitter. 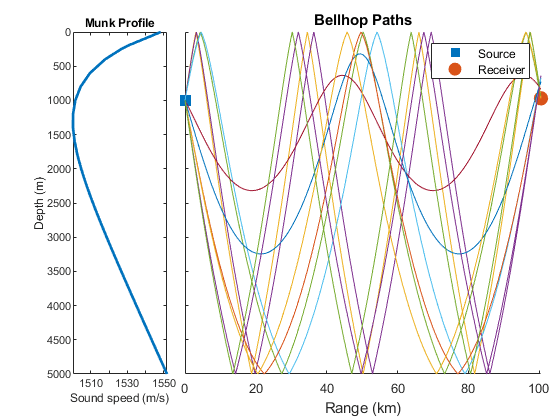 The team identified three main challenges in decoding the captured RF reflections: First, the vibrations are very minute, on the order of a few microns. Second, the reflections are easily masked by the ocean’s waves, which are three to six orders of magnitude larger than the perturbations caused by the submerged sound source. And lastly, the transmitter cannot adjust for the channel quality, especially since the communication is unidirectional. The transmitter cannot receive directions from the airborne sensor. The team implemented TARF’s decoder in MATLAB. They designed filters to mitigate their impact on the received signal. The algorithms decode and eliminate the unwanted interference from the waves by treating them as structured interference. 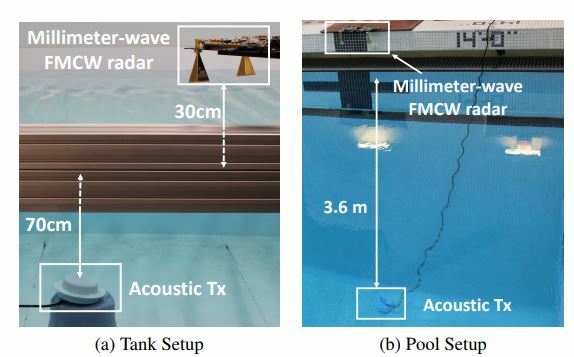 Their signal processing algorithms use the frequency of waves to tell the difference between large, naturally occurring waves and the tiny ones created by the underwater speaker. The initial approach only works in waves of up to 6 inches high, but the team plans to refine the system to work in ocean waves. “Even while there were swimmers swimming around and causing disturbances and water currents, we were able to decode these signals quickly and accurately,” says Adib. Amazing ! Congratulations to MIT Group!